US Ambassador to Israel insists controversial deal will help - not hurt - American efforts to stop Iranian terror proxies. The US marks 14 years since the September 11, 2001 attacks on Friday, in which Al Qaeda terrorists coordinated four separate attacks on US citizens and landmarks. 2,996 people were killed when two passenger planes crashed into the New York World Trade Center towers, one crashed into the Pentagon, and one crashed in a field near Shanksville, PA after passengers heroically battled the hijackers. 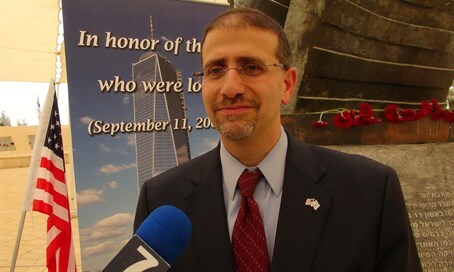 To gain perspective on the attacks, Arutz Sheva spoke with US Ambassador to Israel Dan Shapiro at a special memorial ceremony in Beit Zayit (outside of Jerusalem) on Thursday. "I think the agreement with Iran will actually help us pursue the lesson of 9/11," Shapiro insisted. "The agreement with Iran will prevent Iran from acquiring a nuclear weapon." "That's the most dangerous threat, and once we remove that threat from the table, that allows us to fight even harder, and to counter other Iranian threats - the support for terrorist organizations, the provision of weapons to Hezbollah [...] the threats against Israel," he continued, adding that the deal provides a "safer environment" to achieve those goals. Despite tensions between the US and Israel following the deal, Shapiro also maintained that the Washington-Jerusalem relationship is "stronger than ever." "The values that we share, the common interests that we share, the common security that we both work together every day in our militaries and our intelligence services and our governments, and our people, is really what binds us," he reflected. "We have disagreements - we've had a very honest disagreement about this Iran deal - but in no way will that change the commitments we have to each other."